Ranmaru is a young man who believes in his lord. He is Mitsuhide's pupil and they both begin their services in the Saitō clan. Losing faith in their leader, however, both men decide to prove their worth against the Oda at Inabayama Castle. Their capable defense drives the Oda back momentarily and impress Nobunaga. Therefore, they have their wish granted and soon cause the end of the Saitō family. Following his mentor to Ise-Nagashima, Ranmaru partakes in the massacre of the peasant army. Sympathizing with his mentor's retreat from the field, he stands against Mitsuhide's betrayal undaunted at Honnōji. 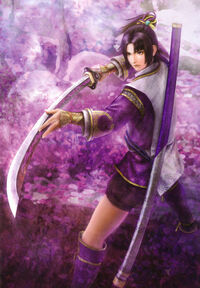 Ranmaru bravely defends the southern gate of the temple to defend Nobunaga's escape with Noh and Oichi. Although Noh defects and dies, both Nobunaga and Oichi escape safely due to Ranmaru drawing the entire Akechi army to his position. Mitsuhide flees from his defeat and allies with Ieyasu at Anegawa. Additionally, Masamune, Magoichi and Keiji utilize the chaos around them to strike against Nobunaga. Strengthening his resolve to defend his lord, Ranmaru simultaneously struggles to consider his mentor as his enemy and wonders if he should kill him.